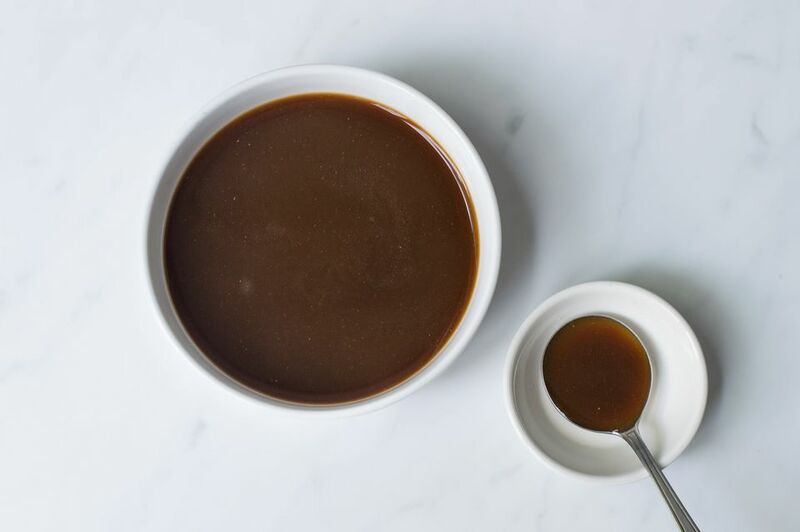 A traditional demi-glace recipe is made by combining a mixture of half basic brown sauce and half brown stock (such as beef stock) and then simmering until it's reduced by half. In this shortcut recipe, instead of making the stock from scratch, store-bought stock or broth is used. It won't have the same body as a homemade demi-glace, but it'll save you about eight hours. Use the best quality stock or broth you can find and stick to the low-sodium, reduced-salt (or even no-salt) varieties. Reducing concentrates the saltiness, and you don't want your finished sauce to taste like a salt-lick. You'll need some cheesecloth for straining the sauce and also for making the sachet d'épices, as well as some cooking twine for tying it up. Place the bay leaf, thyme, parsley stems, and peppercorns onto a square of cheesecloth. Tie it up into a bundle with cooking twine. Heat the butter in a heavy-bottomed pot over medium heat and add the chopped onions, celery, and carrots. Sauté them for a couple of minutes, until the onion is partially translucent. Sprinkle in the flour and stir to form a paste. Cook for about 3 minutes, stirring frequently until the flour is lightly browned, but by no means burned. Now, whisk in 3 cups of the beef stock. Bring to a boil over medium-high heat. Then lower heat to a simmer, add the sachet, and reduce for about 20 minutes or until the total volume has reduced by about one-third. Remove pan from heat and retrieve the sachet (and set it aside). Carefully pour the sauce through a wire mesh strainer lined with a piece of cheesecloth. Now, return the sauce to the pan, stir in the remaining 2 cups of stock, and return the sachet to the pot. Bring the pot back to a boil and then lower the heat to a simmer. Simmer for about 50 minutes or until the sauce has reduced by half. Discard the sachet. Strain the sauce through a fresh piece of cheesecloth. Demi-glace will keep in the refrigerator for a couple of weeks, and in the freezer for months. In addition to standing on its own, you can use demi-glace to make other sauces. Add some red wine and reduce it for a bit and you have the classic red wine sauce. Do the same with mushrooms and shallots and you have a traditional mushroom sauce. Demi-glace is an amazing sauce to serve with red meats, like roasts and grilled steaks. The only difficult thing about it is that making it from scratch can be quite time-consuming. Purists might raise their eyebrows at using store-bought beef stock or beef broth. But the reality is that if something's too hard to make, you're probably not going to make it. Which is a shame, because everyone should be able to enjoy the deep, rich, flavor of demi-glace, which is pretty much the ultimate sauce.